Artwork: “Over the Top” Artist: George Harding. Catalog Number: 11.1.84. 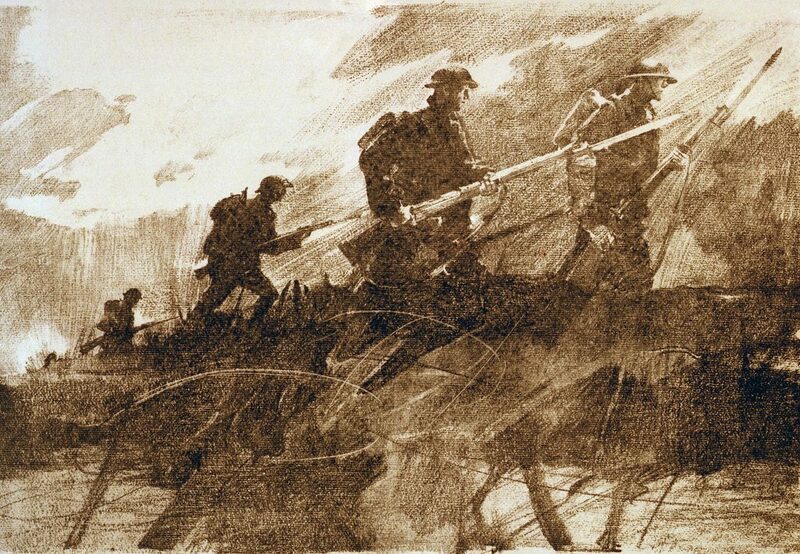 US Army Art Collection. A passing encounter on a London street. This historical novel is about the aftermath of war. Important with historical fiction is authenticity. Is there anything in this opening that strikes you as “out of period”? Synopsis: Olivia, a landed aristocrat who operated a hospital during WW1 on her estate, accidentally runs into James, a soldier she had an affair with during the war. Both of them are struggling to adapt to post-war England and work through the aftermath of the war and their affair. I heard the trouble a few moments before I saw it. A constable tapped his club aggressively against the body of a man in a ragged army greatcoat who was slumped into a narrow alcove between two buildings. The morning rain was tapering off, allowing a few streaks of sunlight to caress the hats of pedestrians hurrying along Charing Cross Road, umbrellas snapping closed as they went, newspapers being tucked under arms. A single ray of sunlight also fell on the man in the army coat, illuminating part of his sleeve and dark, matted hair. I looked away as I passed. Unfortunately, not quickly enough. I shook my head, attempting to ignore the pinch of guilt I felt. There were hundreds like him in London alone. I couldn’t save them all. At the corner, waiting to cross, an ugly thought popped into my mind: what if he wasn’t asleep? It wouldn’t be the first time a homeless soldier had died in the night, unnoticed by scores of people walking past with their minds set on their errands, on where they had to be and when, just as I had done. If I simply walked past as well, that pinch of guilt would become an uncomfortable hair shirt that I’d wear around for days tormenting myself. I turned around and hurried back as quickly as my shoes would allow on the wet pavement. It was none of my business, of course, and I was already behind schedule, but I had to find out for my own peace of mind. Olivia, your last name should be Parker, my father always said, because that’s what you are, a Nosey Parker and a frightful busybody. The taps with the nightstick had become more aggressive, almost blows. I was about to raise my arm and call the constable out when the soldier suddenly moved, grabbing the end of the nightstick and shoving it up and away from himself in one quick, abrupt movement. Caught off guard, the constable did a comical little foxtrot to save himself from falling. Something that did not improve his mood in the slightest. “Awake now, are we? Good! Get up and move along. No dossing here.” A boot was added to the end of the statement in way of a full stop. The man jerked his head up. His face was thin and ashen, a week or two’s growth of dark beard on his chin. He seemed to have trouble focusing, shaking his head a time or two as if to clear it. Once he recognized his tormenter was in uniform, he nodded vaguely and began to search around with one hand in the shadows behind himself, pulling out a long, wooden object. A crutch. The man was an amputee. Despite his moustache and pressed uniform, the officer could not have been more than twenty years old. He puffed out his chest with all the authority his score of years and peaked custodian helmet lent him. The ex-soldier gained his footing, steadying himself against the wall despite his missing leg. He placed his crutch under his right arm and began to hobble off without a word or glance. He was surprisingly tall, at least a head taller than the constable. A reddish-brown scarf hung limply from his neck. It reminded me of the ones we’d knitted hundreds of during the war for the front-line lads. In fact, there was something oddly familiar about the whole man. I opened my handbag and dug out a few pence. “Wouldn’t do that, Miss. It’ll only go for drink. These types are nothing but trouble.” The constable’s voice was shot through with the same chiding tone I was used to hearing. Doing one’s bit during the war was one thing, asking one to take pity on the chewed-up refuse of the trenches a few years on was entirely another. Ignoring the warning, I tugged at the man’s dirty, wet sleeve. He hesitated, eyes fixed on the paving stones. The stench coming off of him was enough to make me feel slightly ill.
“Here. For you. Get yourself something hot to eat.” I held out my hand with the coins where he could see them. As if more on instinct than thought, he held out his left hand. I dropped the coins into his cupped palm, which disappeared immediately into the torn pocket of the army greatcoat. “Thank you, ma’am. God bless,” he whispered, his voice a hoarse rasp echoing from somewhere inside his chest. He held his face averted so that I couldn’t see it fully, and I didn’t blame him. Accepting charity could be difficult for many of us, myself included. Moving the crutch forward first, he began to hobble away in a strange parody of a man walking with determination. I turned as well and quickly resumed my path towards Leicester Square. London was somewhere I visited for only one day every fortnight, and I had to make the most of every minute, cramming business meetings, shopping and social calls all into a few short hours. I still had some errands that needed attending to before Brooks was due to arrive with the car at eleven. Charlotte was expecting me for lunch at her home in Belgravia, and I was clearly going to be late now as a contract negotiation had turned out to be thornier than I’d expected. I so hated to keep friends waiting. Editorial comment: I really like this. I like it for the contrast of her life, lunch in Belgravia with Charlotte, with the stench from a vagrant so strong it nearly made her ill. Anyone who knows London, or any big city, knows that extreme poverty and immense wealth co-exist, often on the same street. What makes this story more poignant is that this isn’t some poor, ill-adjusted drop-out who has fallen on hard times. This is a soldier who only a few years earlier was fighting for the nation in a foreign field giving blood, literally, to keep those privileged lives unsullied by war. That makes his situation, and treatment, even more painful. I don’t understand why she thinks “Unfortunately, not quickly enough.” This seems out of character. She comes across as a charitable individual, and not one of the people for whom engagement with a vagrant would be an embarrassing, awkward event. “Calling someone out” is a very modern phrase, I think. It doesn’t sound as if it belongs in Edwardian London. Be careful with idioms that aren’t consistent with the period; they can wreck the authenticity you’re trying to build up. I don’t get why she’s used to hearing a “chiding tone”. Is she often in this situation? “a strange parody of a man walking with determination” I don’t really get this, either. He is determinedly walking away. He just happens to be an amputee. There is one issue that would give an agent pause when looking at the submission in its entirety. You say that the wordcount is 35,000, and tell me in your notes that the book is three-quarters finished. Historical novels tend to be on the long side of normal, 80,000 words plus. If the wordcount of the finished novel is going to be sub 50,000, that will be an issue for some agents. It’s a little too long for a novella, a little too short for an historical novel. It’s not that there are required wordcounts for a particular genre, but there are generally accepted norms, and anything outside those norms creates a bit of a marketing headache. Of course, if you independently publish, you have no such constraints, which is one of the joys of going it alone. You might need to price the finished work accordingly, but you can relax in the knowledge that the story can be as long as it needs to be. I think this is nearly there. The length issue is something you need to think about (but perhaps I’ve got the wrong end of the stick and your finished work will be a lot longer). The other thing that would worry an agent looking for historical fiction specifically is authenticity. We all know the film bloopers where an Ancient Egyptian charioteer’s cloak flies back to reveal he’s wearing a watch. There’s only one example here, but it would be worth running through the full work making absolutely sure that not only the scenery and the props are authentic, but that the dialogue and idioms are too. I’ve had someone who knows interwar England fairly well (not a professional historian, however) go over the language and phrasing. ‘To call someone out’ isn’t one she flagged but I’ll look that up! It’s dreadfully difficult to find post-war phrasing on the internet as most sites give only American phrases, not British. I’m not British, nor do I live in the UK, which means I have to rely on the net and British readers for information. Not ideal! Yes, the 35k is what I have so far. I’m not sure how long it will end up. It’s tough to find out such things. One resource I use is Google Ngram (if you google that it will deliver you to the site). This looks through a body of literature to find the phrases that you specify, and dates them. It’s not 100%, but it’s a good guide. If you run “calling someone out” through Google Ngram, it indicates that it’s a very modern expression indeed, only coming in to common usage around the 1980s. Hello! I’ve looked up ‘to call someone out’ in several dictionary sources and it seems it’s a duelling term from the early 1800s. Oxford lists it as being ‘primarily American’ however, which might be because it became archaic in the UK (when duelling died out) but lived on in the States, and was re-imported and revived with a slightly different meaning through film and TV. That’s happened with some words. North American: Draw critical attention to someone’s unacceptable actions or behaviour. Archaic (British): Challenge someone to a duel. That’s really interesting. I think the point still stands, because the archaic meaning has fallen out of use and the very modern usage, which means more point out that something is wrong, or call behaviour to account is very common, and very modern. “I called Jack out on his racist attitude”. The speaker isn’t actually challenging Jack to a duel, but pointing out to Jack that his attitude needs adjusting, which is the sense with which you’re using the phrase. I don’t think that would have happened in the period you’re writing in, particularly not in the UK. Even now I would regard it as a very US phrase, although it does filter into UK usage, particularly among millenials. But you’re absolutely right about the etymology. I’m sure that explains the derivation of the phrase, which has changed meaning slightly over the centuries. One of the perks of this job is discovering interesting quirks of the language, and how they have evolved. Well done!